You like me, you really like me! You are here just to read about me and what I have to say. Well, let's start at the very beginning, shall we? I was born on a cold winter night when the wind was blowing and the snow was falling...oh....wait, what was that you say? You're here to find out who won the John Newbery Medal and the Randolph Caldecott Medal, and not hear my life story? Well, this is a bit awkward. I must say that this changes things a bit between us. I would say I am a little disappointed in where your interests lie, but oh who am I kidding? I can't stay mad at your for long. And who can blame you? I am pretty excited about the Medal announcements myself. So, without further ado....the winner of the John Newbery Medal for the most outstanding contribution to children's literature goes to....oh, I am so nervous I can hardly type...The Crossover written by Kwame Alexander. Two Newbery Honor Books were also names, and they are, El Deafo written by Cece Bell and Brown Girl Dreaming written by Jacqualine Woodson. And wait, there's more! 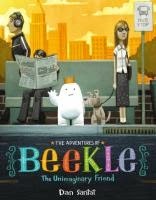 We still have the Randolph Caldecott Medal to The Adventures of Beekle: The Unimaginary Friend illustrated and written by Dan Santat. I have to admit, this is also one of my favorites for this year, so I couldn't be happier! Nana in the City illustrated and written by Lauren Castillo. The Noisy Paint Box: The Colors and Sounds of Kandinsky's Abstract Art illustrated by Mary GrandPre and written by Barb Rasenstock. Sam & Dave Dig a Hole illustrated by Jon Klassen and written by Mac Barnett. Viva Frida illustrated and written by Yuyi Morales. The Right Word: Roget and His Thesaurus illustrated by Melissa Sweet and written by Jen Bryant. This One Summer illustrated by Jillian Tamaki and written by Mariko Tamaki. And there you have it folks - the greats of 2015 in children's literature. Be sure to come on in to the Roselle Public Library and check them out. You can watch the award show at the link below, and also see the numerous other winners of other awards. So, doesn't this get you in the mood to host your own award show? Gather a whole bunch of books and friends. Have everyone read all of the books, and then take a vote for which one was the best. Go all out with fancy reading glasses, popcorn, and make a fabulous medal of your very own. This seems like the perfect activity to do when we are so snowed in and it is so cold out! Well, enjoy the medal winners, and don't worry, I will forgive you for not wanted to hear my life story...maybe.